A technique is presented to identify broken rail as a result of elastic guided wave propagation through the rail. The detection of broken rail is made possible by either utilizing an impact device or energy propagating from the train wheel in contact with the rail. In principle, elastic guided wave energy propagates along the track, a natural wave guide, until a broken rail is encountered. Pulse echo reflection is then used to identify broken rail. Considering an exponential decrease in penetration power from a source as a function of distance and natural energy filtering mechanisms of a rail, a model of guided wave propagation in rail is discussed. A feasibility demonstration of the concept is presented for a train going 50 miles per hour ( 90 km / hour ) towards a broken rail with sensors fixed on rails close to the break. Broken rail in the railroad industry is a threat to public safety, a potential cause of environmental damage, and a financial burden as well. Many techniques have been developed for detecting rail damage that make use of a special rail inspection car, for example, that routinely travels over rail and points out defects. See [1-6]. Track circuits are also available but are often unreliable, see . A need exists, however, to more efficiently detect broken rail on a regular basis and not just when the rail car or walking inspection service is carried out. A technique is presented in this paper that makes use of elastic guided wave propagation in a rail. Basic principles of guided wave propagation used to support the ideas in this paper can be found in . Elastic waves are generated from the train itself and fixed transducers at key rail locations are used to determine rail breaks as the train approaches the break. As an engine and train come speeding down a railroad track, a great deal of energy is imparted to the rail system that leads to wave propagation and vibration that can propagate miles beyond the actual train before damping out. Illustrated in Figure 1 are some considerations of the generation of waves and vibrations into the track system. Longitudinal and flexural mode excitation is illustrated in Figure 1 and lateral mode excitation from the wheel onto the rail also occurs. In reality, there is a very complex three-dimensional nature of wave propagation that must be considered. Vibrational behavior of the rail is produced as a result of multiple modes of wave propagation. Hertzian contact loading pressures lead to moving point sources down the rail. As a result also, of the rail tie foundation and somewhat periodic nature of the tie spacing, rail lengths, and wheel spacing, harmonic loads are forced into the rail system. As in most wave guides, i.e. bars, cylinders, plates, the rail is a wave guide that permits certain wave modes and frequencies to travel efficiently in the rail. The rail system, in essence, acts as a filter, with preferred modes and frequencies of wave propagation and distinct phase and group velocity values. Frequencies can be either sonic or ultrasonic. It is this idea of wave propagation from the train that in combination with fixed sensors on a track can be used to locate broken rail. Some modes and frequencies can detect broken rail better than others, particularly for partially broken rail. Experiments and appropriate signal processing are used to find the best modes and frequencies for the broken rail detection. Let's now consider the reflection principles associated with an elastic wave as it travels along a rail which encounters a broken rail. For a particular incident mode, let's say I1, impingement onto the free edge results in mode conversion. Energy will be reflected as modes R1 and R2. The modes will be of the same frequency, but have different amplitude, phase velocity, group velocity and wave structure characteristics. Quite often, identification of the reflector, in this case, a free edge, can be carried out by an observation of the mode conversion characteristics. Experiments were conducted on various rail systems, on up to a mile in length, that show a relative amplitude exponential decay characteristic that is similar to that shown in Figure 2. Depending on the kind of rail system, whether it be welded or joined by angle bars, or a particular rail and/or foundation type, aspects of the exponential decay curves could vary considerably. This means, of course, that waves don't propagate forever, and that we must take advantage of some finite distance of travel to produce a reasonable receiver sensitivity for detecting the broken rail from the elastic waves generated by the train. A projected sensor time history of the elastic wave energy as the train approaches the sections of an instrumented rail without a break, and also with a break, are illustrated in Figure 3. Notice that if we place sonic or ultrasonic sensors at positions 1 or 2, if there is no break in the rail, the signals received at sensor 1 and sensor 2 positions are approximately the same. On the other hand, if a break were to occur between the two sensors, the output at sensor 1 as the train approaches the sensor would increase in magnitude very substantially as a result of both impinging elastic wave energy and reflected elastic wave energy from the broken rail. On the other hand, the output at sensor 2 is reduced considerably consisting of a noise pattern, as illustrated in Figure 3. Feasibility studies were conducted at the TTC precision test track in Pueblo, CO. The train was started approximately at a distance of 3.5 miles away from a broken rail in the track with sensors placed on the rail about .65 miles from the break. The baseline signal occurred with the train on the track 3.5 miles away from the break. Some instrumentation and other random noise is obviously included in the baseline signal. Imagine now a train coming down the track from the 3.5 mile position speeding up to approximately 50 miles per hour. The train produces elastic wave energy that propagates down the rail. For the feasibility studies, signals obtained at the sensor 1 and sensor 2 positions were used to monitor the signals for the broken and unbroken rail. Accelerometers were used in this study and placed on the web of the rail. 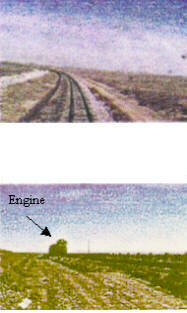 Signal processing was used to extract sonic and ultrasonic guided wave signals from a time segment of the rail signal. From a gated segment of the rail signal, the spectral content was obtained, upon which an inverse Fourier transform was used to obtain time domain signals at particular frequencies. It turns out that in our analysis, a number of different frequencies could actually be used to detect the broken rail, but some at distances further from the train than others. A sample broad banded wave pattern illustrating the broken rail detection experiment with a train moving towards a break is presented in Figure 4. In 4(a), no train is on the track, providing the so-called baseline signal. In 4(b), the distance from the train coming down the rail, was about .3 miles away. The total sound path from the train to the broken rail back to the sensor was 1.6 miles. Notice that for the broken rail detection on the right side of the figure, an excellent result is obtained by way of overall increased amplitude. It is shown in this paper that elastic guided wave energy can indeed be generated from the train moving down the track and that appropriate sensors and signal processing can be used to detect broken rail ahead of the train. Variations on this theme can also be considered by using impact or plunger type devices to excite the rail itself and then by using transducers to depict whether there is a broken rail between the sensors or not. Another variation might be to use receiver devices from the train itself, whereby a broken rail can be detected at some distance beyond each train equipped with such receiver devices. We would like to thank the Office of Research and Development of the Federal Railroad Administration for their support of this work. Armstrong, J.H., The Railroad, What it is, What it does, 1998. Simmons-Boardman Books, Inc.
Hay, W.W., Railroad Engineering, 1982. John Wiley & Sons. Sperry Rail Service, Rail Defect Manual, 1964. Proceedings of "Rail Defect & Broken Rail Detection - Expanded Workshop", R. P. Reiff, Ed., Transportation Technology Center, Pueblo, July 1997. Krautkramer, Ultrasonic testing of materials, 4th edition, 1990. Springer Verlag, New York. Army Engineer Waterways Experiment Station Vicksburg MS Geotechnical Lab, "User's Guide: Automated Railroad Track Inspection", August 1996. Stark, D.E., Ehrlich, A.G., Guillaumin, B., "Broken Rail Detecting Track Circuits", Patent No. 4,117,529, published in Official Gazette; 974, 4; 26, September 1978; 2235. Rose, J. L., Ultrasonics Waves in Solid Media, 1999. Cambridge University Press.